River Dance Lodge is the inspiration of Betsy Bowen and Peter Grubb who also own and operate ROW Adventures. The journey begain when I (Peter) got a summer job in 1978 working as a river guide on West Virginia’s New and Gauley rivers. In 1979, I came to Idaho to work longer trips on the Salmon and Selway rivers. It was exciting work, meeting great people, running rapids, sleeping under the stars. I learned that dynamic things could happen on the river - magical things! It was tremendously fulfilling. In the fall of 1979, Peter decided to launch his own river rafting company, ROW Adventures, originally an acronym for River Odysseys West. A few years later he met and married Betsy Bowen, who remains his wife and partner in all of our various operations. From the beginning, our goal was to provide an uncommon level of personal service that puts the enjoyment of our guests above all else. We've discovered that in order to keep the adventure alive for you, we need to keep it alive in ourselves. This has led us to new rivers, activities and destinations. From a humble beginning with trips on two rivers, we now offer a wide variety of adventures in multiple countries on four continents. Every trip we offer is one we’ve personally researched and developed. In 1984 the Forest Service permitted a select few outfitters to run whitewater rafting trips on the Lochsa River and ROW was chosen among the many that applied. This world-class whitewater trip quickly became a favorite of our guides and guests. 18 years later, in 2002, we decided to build River Dance Lodge – Idaho’s Outdoor Adventure Resort. To this end, we bought five acres that included an older restaurant building situated on the banks of the Congressionally protected Wild & Scenic Clearwater River in North Central Idaho, close to the 1.3 million acre Selway-Bitterroot Wilderness Area and three miles from the historic Lewis and Clark Trail. 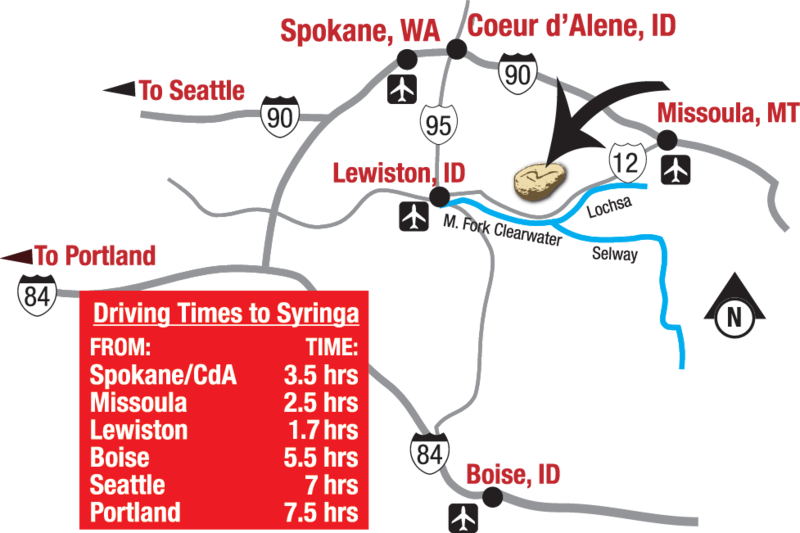 After an extensive remodel, we opened the Syringa Cafe in 2004 and then began construction of our log cabins. Our rustic luxury accommodations opened in 2005 and include eight handcrafted log cabins with private hot tubs. In addition to Lochsa rafting trips, we now offer a rich treasure trove of day-trip adventures in the surrounding wilderness. Today our adventure resort offers vacationing couples and families the best in lodge-based recreation, with activities that include kayaking, rafting, mountain biking, hiking, and outstanding fly fishing. River Dance Lodge is a true celebration of wild rivers, nature and adventure sports. River Dance Lodge is an ideal location to explore a part of America that few know. Lewis and Clark passed near here over 200 years ago, and many come to explore the Lewis and Clark Trail and Lolo Motorway. Others come for the productive fly fishing on the Lochsa River. The area is also rich in the history and culture of the Nez Perce Indians and the important site of “Heart of the Monster” is not far from our lodge. Whether you come for rafting, hiking, biking, fishing or simply relaxing, our hope is to set the stage for a rejuvenating vacation. Guests who come to River Dance Lodge often find that relationships are renewed, eyes begin to sparkle and laughter returns. In this, we find our fulfillment. Our campfire is lit. Please come and share the warmth. It takes a solid team to keep River Dance Lodge running smoothly. In addition to our core staff above, we have seasonal staff that support them in our mission of providing superb vacations. 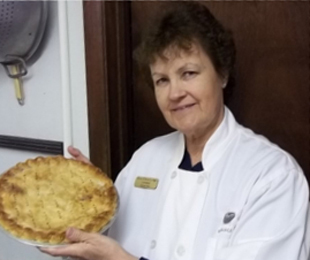 Neighbor Lorraine Smith makes our famous huckleberry pies, using a recipe that dates back to when the cafe opened in 1962 and her mother made the pies! Her husband Greg is a chef in our kitchen, assisting Tamer in preparing delicious meals. We also have other lodge support staff and activity guides, all eager to welcome you and ready to make your stay the best it can be. "Awesome! The rapids were unbelievable - so fun! Excellent food at the restaurant - the lasagna was to die for. Beautiful mountains and scenery! Thanks for the memories!" "Wild, wonderful ride, but a peaceful weekend with old friends. The food was sooo good and the guides and staff were perfect! The cabin was a great retreat. We'll be back."